Fitness Formula Clubs (FFC) is a full-service fitness center offering group fitness and personal training with nine locations in the heart of Chicago, Illinois. In August 2009, FFC added the Presidential Towers Health Club to its network of Chicago-land locations. 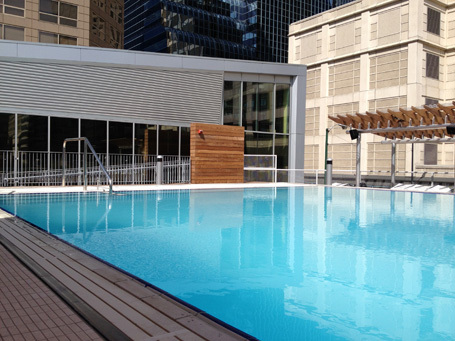 At this time, FFC retained Counsilman-Hunsaker, in association with Antunovich Associates, to provide a swimming pool audit on the 26-year-old lap pool and spa at the West Loop location, situated on the third floor of the Presidential Towers building. The audit identified items that were substandard, not compliant with Illinois swimming pool codes or current industry swimming pool design standards, and determined if equipment was operating as designed. New swimming pool technology was discussed to assist with current challenges experienced in relation to operating the pool. In 2010, the Counsilman-Hunsaker/Antunovich Associates team was once again retained to design a new 20 ft. x 60 ft. relaxation pool located on the outside terrace deck of the 3rd floor. The new pool consists of an in-pool lounge area, water volleyball and a flowing water feature. The current fitness facility has been completely renovated and expanded to 52,000 sq. ft. on two levels, more than double its previous size.